In the Robert Burns Birthplace Museum in Alloway, Ayr thair a big mural in the exhibeetions area that’s a kindae parody o the Last Supper. In the centre o the tableaux is nane ither than oor national bard Robert Burns, surroundit bi kenspeckle fowk frae history. The likes o Beethoven, Che Guevara, Nelson Mandela, Elvis Presley, Marilyn Munroe and Mohammed Ali, etc... As ye wid expeck frae a Burns relatit eemage, the gender mix is gey skewed! Ah’m ettlin that onybody wha’s e’er taen aff their dram at a bar at lowsin time hus bin privy tae that timeless an universal conversation anent the human condeetion – or leistweys yin like it. Baith these pieces hae bin written bi mature fowk wha hae vast experience o life an its intimate an profound conversations. But the airt o conversation needs tae be lairnt – sae whaur did Burns lairn it? Ah dout we maun gae back tae Burns’s early bairntid. His faither wis an enlichtenment Scot wha hud the smeddum an nous tae ettle that the anely wey his weans wid get oan in the warld (an William Burnes wantit his weans tae get oan) wis throu education. Burnes hired a tutor, John Murdoch, tae schuil the young Robert an his siblings. At aroond 10 years o age Burns wis gien an innins tae the warks o Shakespeare, an alsae his first rael buik, ‘The Life Of Hannibal’. Burns soaked this up lik a sponge! He becam a voracious reader, an wid remain sae aa his days. Likesay, gin ye’re gaun tae add somethin meaningfu tae ony conversational ongauns ye maun hae somethin tae say – an the seeds o that ‘somethin tae say’ fir Burns wir gleaned frae this verra early leeterary hairst. In days lang afore the norrie o telephones or email, haund written letters wir the main form o personal communication. Burns strove tae be a great letter writer; his style ‘borrowed’ frae the likes o Masson’s Collection and Elizabeth Rowe’s Moral Letters, an bi close study o anither buik he’d purloined, Letters by the Wits of Queen Anne’s Reign. In life Burns brunt the caundle at baith ends, an nae mair sae than when readin evri buik he cuid get his haunds oan late intae the lown Ayrshire nicht. Keep mind, libraries then wir rerr things – tho agane, Burns’s faither hud peyed his stent tae be a private subscriber o Ayr Library, an he alsae subscribed tae periodically published new warks, which wid hae cost him the equivalent o twa months haurd earned wages. In Janwar, 1787, wi a buik o poems, ‘The Kilmarnock Edition’, unner his airm, an buskit brawly in the mainner o a bien Ayrshire farimer – wi his best buits buffed tae a heich gloss, his ‘unquestionable genius’ made its mark afore the Duchess of Gordon an her set o Embra sophisticates. Gin we anely hud a recordin o that conversation! Burns hud a naitrel gift that alloued him tae ‘...walk with kings – nor lose the common touch’. His conversation cuid soar wi the benmaist an faur-i-the-buik academics o his time, but Burns hud cairds up his sleeve nane o thaim cuid match. This jurmummle o Ayrshire ‘dirt an deity’ cuid frequent the lowest howffs an be jist as at hame there as in the ‘finest houses’. An here he cuid carouse an jingle up coorse sangs, baurs an rhymes tae satisfy the likes o the Crochallan Fencibles or Cape Club in aa their bawdy, drucken ongauns. An uise Rab Mossgiel’s ‘tongue that’s smoothly hung’ tae seduce the sairvin lasses o Auld Reikie. The conversation conteenued in a mair seditious tones much later, when the ‘swinish multitude’ daily threatened in Dumfries, an revolution, frae France an America wis in the air. In times when ‘abune yer braith ye daurnae mutter’ wis the watchword, Burns widnae haud his wheesht – but bi this his health wis ruined, an aiblins he wis past carin... His ‘staunch republicanism’ widnae be husht – an at the bitter end he still spake truth tae pouer. Whaur are the Burnses nou tae cairry oan his conversation...? 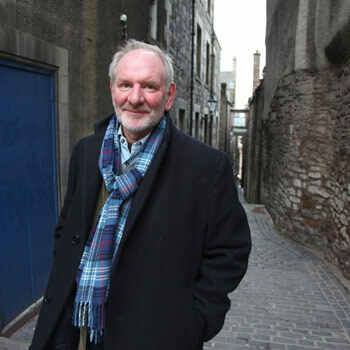 Rab Wilson is one of Scotland's most accomplished poets. His poetry in Scots is distinguished by its oral quality and by its technical assurance. The author of a number of highly praised volumes of poetry, he is also a valued Burns scholar. He has worked with the artist Calum Colvin on a book of responses to Burns and he is the Scriever in Residence for the National Trust of Scotland based at the Robert Burns Birthplace Museum in Ayr. A Year of Conversation 2019 is a collaborative project designed to celebrate, initiate and explore conversation through the creativity of those who live here.